This is a guest post by Sophie Mayer. She is the author of The Cinema of Sally Potter: A Politics of Love, and a regular contributor to The F-Word and Sight & Sound. This is Not a Film (2011) is not a film by Jafar Panahi: the Iranian director is currently under house arrest in Tehran, forbidden from making films for 20 years. Using a DV camera and iPhone, Panahi’s close friend Mojtaba Mirtahmasb filmed Panahi in his apartment and the edited footage was smuggled into France on a USB stick hidden in a cake. The film that This is Not a Film specifically is not is the one Panahi was researching when he was arrested in April 2010. The unmade film is about a prisoner in their own home, a young girl locked in her house in Isfahan by her parents, a scenario that seems like an uncanny premonition of Panahi’s house arrest. But it is also a precise metaphor for many Iranians’ experience under the current regime, evident in the claustrophobic fixed camera used by Panahi’s mentor Abbas Kiarostami in his film Ten (2002) or in the story of imprisoned sisters in Samira Makhmalbaf’s 1998 Sib (The Apple). What’s fascinating about Panahi’s work is how often he turns to the figure of a young woman as a symbol of resistance within Iran, to the point where this girl comes to stand for Panahi and his filmmaking. In his second film The Mirror (1997) the young lead actor decides during shooting she’s had enough of pretending to wear a plaster cast and be lost on a Tehrani bus. Panahi keeps the camera rolling and her resistance to his fiction becomes the subject of the film as he follows her lead, collaborating with her to a unique degree. It’s with this decision to go with the flow that Panahi’s films move on from being poetic allegories to becoming tougher, funnier and more engaging, with the loose improvisational feeling yet rich political awareness of the early films of Spike Lee. Shot with a small crew on the fly in real locations and using non-professional performers, Panahi’s films don’t so much blur the boundary of fact and cinematic fiction but break with it entirely. They are risky, exciting and dynamic: qualities they tend to situate in their female protagonists. 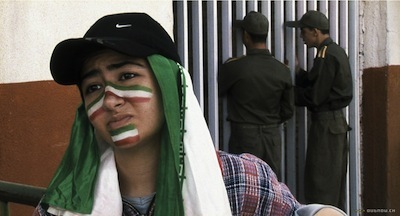 In his most popular film, Offside (2006), an unnamed girl disguises herself as a boy to sneak into a World Cup qualifier between Iran and Bahrain. S/he makes it inside but not into the seating arena so Panahi films the main body of the action in the concrete surround of the stadium as the real match takes place, providing both a soundtrack and a real sense of tension. As Iran won on that occasion, the film ends with the protagonist travelling home, having stood her ground without getting arrested, on a tram through a city lit up with fireworks. This is Not a Film also ends with fireworks, for Nowruz, which Panahi can only watch through his window. This narrow frame on the outside world is reminiscent of his breakout (and most complex) film The Circle (2000) which uses at times a vignetted frame suggestive of the point of view from inside a headscarf. The Circle reveals and critiques the limitations placed on women in Iran, showing the creative but risky ways in which they negotiate them. It bears witness to the realities of prostitution, imprisonment for moral crimes, familial male violence against women and abortion but is far from straightforward preachy realism. Winner of the Golden Lion at Venice in 2000, The Circle is still banned in Iran. Panahi’s commentary on the film included in This is not a film sent me back to re-watch it. Re-entering its paranoid atmosphere, I marvelled again at the determination and creativity of both the characters and the filmmaker within their constraints. Under the surveillant eye of ever increasing CCTV, and with London’s streets militarised, I can’t think of a more subversive gesture from the BFI this summer than to showcase Panahi and his younger colleague Mohamad Rasoulof (born in 1973, he had his first feature The Twilight released in 2002). Throughout August at BFI Southbank in London you can – like the protagonist of Offside – enjoy all the excitement of watching human beings struggle to excel, to take pride, to escape bounds: all the worthwhile and resonant intentions of the Olympics that get lost in the corporate blah. At the same time, the showcased films will keep you aware of the forces that limit what we see and how we see it. Which of Panahi ‘s films won the Un Certain Regard Jury Award at the Cannes Film Festival?